Eating guacamole by myself at school is sometimes a waste; at our supermarket, it only comes in medium-sized tubs, so by the time I’ve had my fill, my guac has already turned an unappetizing brown color. Home, on the other hand, is a different story. When Laura and Jackie get back from school, I can put together a fresh guacamole in less then 10 minutes and it’s gone in 5. In my opinion, guacamole is better when it’s simpler. 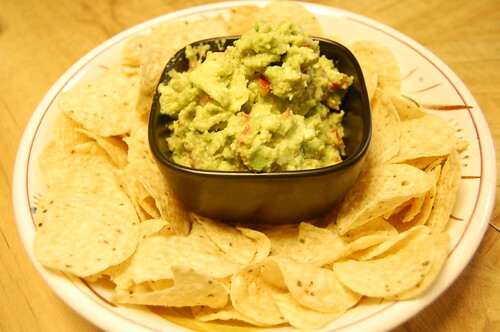 This recipe is really basic, and I love it with some blue or lime salted tortilla chips. Put everything in a bowl and mix well. You can use the back of a fork to mash the avocado to start. Add the cilantro and jalapeno, if you want, right before serving. Season to taste. « Answer to laziness? Why, more carbs, of course. You are currently reading Snackin’ on Guac at Notes on Food.